Cataract is the most common disorder known to mankind. Cataract surgeries are the most commonly performed surgeries in the world. Cataract is truly not a disease but an age related change that occurs in the eye.Just like a lens in a camera focuses objects, the lens inside the eye acts similarly. The lens is a clear, glass like structure when we are young, and when we age this clear lens turns opaque resulting in poor vision. This is cataract. 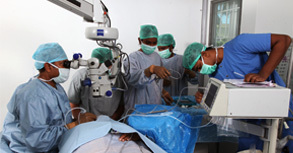 Advances in medical technology make cataract surgery a day care procedure where the duration for surgery typically lasts around 6 to 7 minutes without injections or stitches. Following this, normal vision is restored with no requirement of dark glasses/ eye patches. Routine activity including driving, cooking or watching TV can be resumed within a day or two after the procedure. We use the latest ZEISS LUMERA 700 operating microscope and the AMO SIGNATURE PRO phacoemulsification system which is the most advanced in the world. This surgical experience is augmented with facilities like iTrace, IOL Master 700, image guided surgeries (Callisto Eye) and Robotic Laser which are performed with high degree of precision delivering excellent results. Uma eye clinic is one of the earliest to perform Robotic laser cataract surgery with the most advanced Robotic laser system (Catalys). When surgeries are performed with Robotic laser system (Catalys), it is more gentle on the eye with higher degree of precision and accuracy to provide excellent outcomes. At Uma eye clinic, we also provide a wide range of modern high and Intra Ocular Lenses, Aspheric IOL, Multifocal IOL, Trifocal IOL, EDOF IOL.